Happy New Years!! I plan to spend the next few days getting some intensive swatching done, so look for lots of reviews to pop up next week, including the above! Also, I am really looking forward to my The Body Needs review as well as a review of some items I picked up from Morgana Cryptoria. These are first time buys for me, so this will be a lot of fun. I look forward to sharing my love for all things beauty with you in 2012! Have fun and be safe! Oooooh. Swatches are popping up all over tonight for the new Iris Apfel collection by MAC and I dare say, MAC you may be restoring my faith in your brand. Robins Egg and Party Parrot I'm looking at you! I just have a tiny review today. I've been looking at beauty products I reach for frequently and this is one such item. 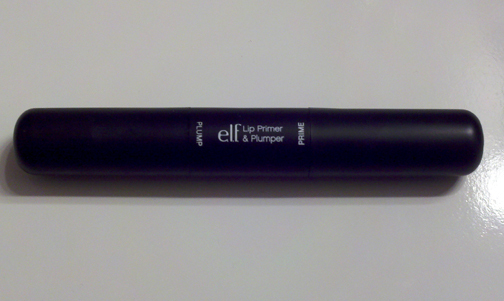 This also falls into the ever popular super affordable beauty category. This product is a combination of a primer on one end and a lip plumper on the other. 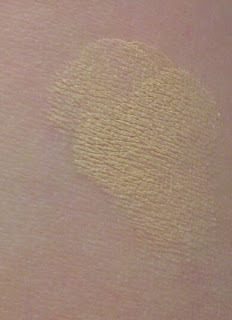 The primer looks and feels alot like a stick concealer and I believe only comes in one shade, which is a warm ivory color. 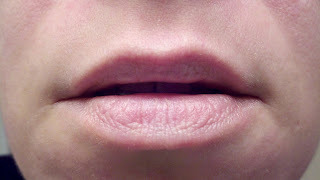 Since you will be layering your lip color over this primer, I think it will work for all but the very darkest skintones. It doesn't completely neutralize my lip color, but that's not really my concern. I don't like lipstick migration and this goes a long way to fixing this. On days where I don't want to bother with a lip liner, I find this primer will hold my lips together except for the deepest most vibrant lips..no escaping the extra work on those. You may notice my review of the plumper conspicuously absent. Truth is, I don't use it. I don't think plumpers work. They are an irritant applied to skin to achieve a desired effect. A. I don't like the idea of intentionally distressing any part of my anatomy. B. They just don't do what they claim to do. The plumper tastes and smells of cinnamon red hots and burns/tingles for a few mins before fading to nothing. The burn on the plumper comes narrowly close to being uncomfortable. I don't care for it even as a balm. It doesn't keep my lips moist or supple. It's just....there. If you look at enough reviews you will notice a lot of people like 50% of this product, you either like the plumper or the primer....for $3 I don't feel bad that I only use 1/2 of it. E.L.F. is another buget brand worth checking out and one I plan to review here over the next few months. 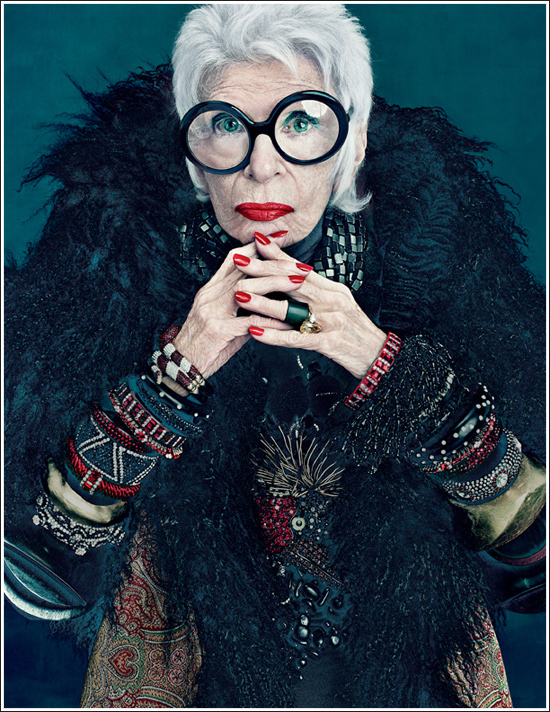 They have some gems, they have some duds. But with the affordable pricing, you will not kick yourself if something doesn't work for you. Milani is a budget brand that is catching fire lately with some amazing offerings in the way of baked blushes, eyeshadows, lipsticks and these gems, Lip Flash Gloss Pencils. I have a pretty tough time finding Milani where I live, so when I stumbled upon these during an epic quest for a King's Castle Lego set (the stories I could tell) I jumped on it! The first thing I noticed was the similarity between Lip Flash and my beloved Stila Lip Glaze stick. They are exactly the same size, shape and if I can ever find a sharpener to fit either one I will be all set! However, surface appearance is where the similarity ends. 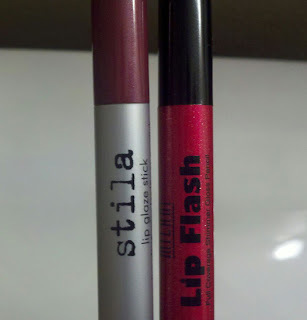 Where the Stila Lip Glaze stick was a dreamy gloss in stick form, the Lip Flash is way more tacky. I struggle to find another comparison for the way it feels on. It glides on smoothly, but it is very very sticky. This is actually a plus for me. I really like a tacky, sticky gloss and this fits that perfectly. 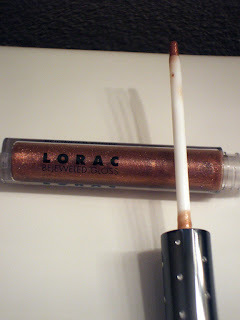 It goes on nearly opaque with a great suspension of glitter throughout the formula. These were not drying at all for me. On it's own I would say I got a good 1-2 hours before I noticed it started to fade and bleed a little. My favorite way to wear this is over a lip pencil and it is really fun to try over different colors. 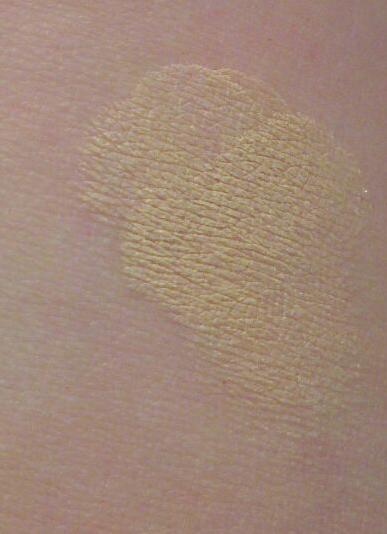 I tried this over MAC Summerfruit and MAC Portside and each shade brought out some different in the product. It is really versatile in that way. 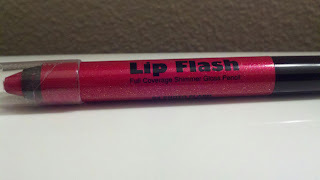 The color I tried was Photo Flash, which in the tube looked to be a vibrant cherry red. 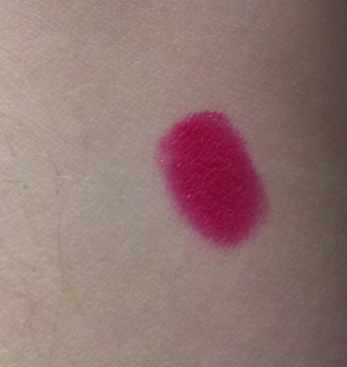 In reality this is a reddened fuchsia with red and pink glitter. Put this over a red or dark base, you will bring out the red in the glitter, put this over a lighter base and the pink really pops. It's a lot of fun to play with. 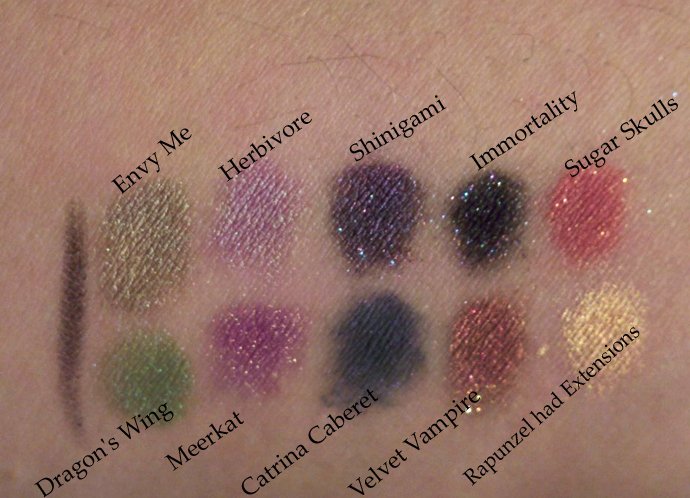 If you follow beauty blogs or indie makeup at all, you've no doubt heard of Fyrinnae. Fyrinnae is a small independent makeup company that hand crafts high quality, intense, vegan shadows,blushes,lip lustres and more! In this post I will look at some of Fyrinnae's gorgeous loose shadows. One of the things I really like about some of the smaller independent beauty companies is the ability to purchase samples of products. Fyrinnae offers sample sizes of pretty much everything they make, including cult favorite Pixie Epoxy. 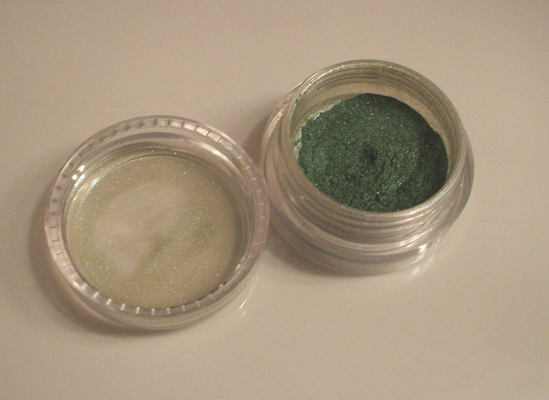 Sample shadows are approx 1/4 to 1/3 teaspoon sent in a small plastic jar and cost $2.00. 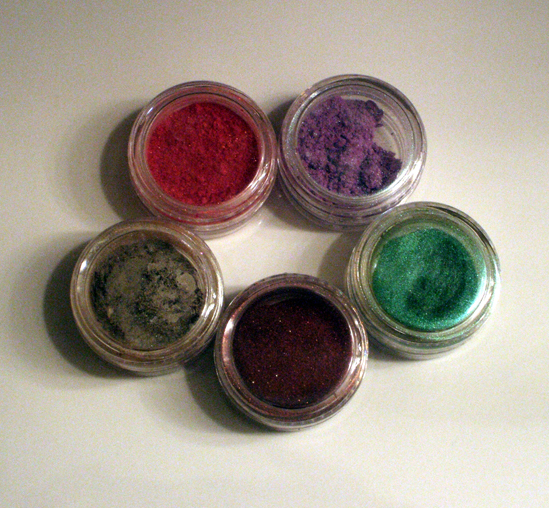 Full sized shadows are 3 grams and range in price from $5.90 - $6.35. With the intensity of color in these shadows I can't even imagine ever using up a full size jar....I don't think I could use up a sample. At these prices you can afford to be adventurous and try some colors outside your comfort zone. I am a sucker for taupe and greens and I purposely made myself try colors I wouldn't normally try. Pictured above are some of the shadows I purchased along with a sample of Pixie Epoxy. Now I want to start out by saying that Pixie Epoxy is absolutely everything everyone says it is. It really enhances Fyrinnae shadows and all my swatches here are done dry over Pixie Epoxy. That being said...I really don't care for it. It does it's job too well! When you put down the layer of Epoxy, it leaves yours eyelid super tacky and any shadow you pat on will grab on for dear life. There in is my issue. I have a hard time blending these shadows over Epoxy....honestly, I have a hard time blending them period. They state several times on their website that these shadows do not work well with the "sweeping" application many of us are used to. You are supposed to pat these on, which is fine, but when I go to blend the crease I find these muddy and fade easily. I freely accept this can be user error, just know going into this that these shadows take a little more finesse then your typical loose shadow. I am posting the best photos I could get of my Fyrinnae shadows. These mothers are really tough to photograph, maybe on the perfect sunny day, but photos really do not do these shadows justice at all. Even the Fyrinnae website can't take a truly representative photo..they are too nuanced and layered and well..awesome! Top left to right: Envy Me (shimmery beige with subtle green duochrome) Herbivore (lavender with green duochrome) Shinigami (rich eggplant with multi color sparkle) Immortality (indigo with multi color sparkle) Sugar Skulls (rich raspberry with strong gold sparkle). Out of all the shades, the only one I didn't care for was Catrina Cabaret. I've heard raves about the complexity of the color, but I can't find it. It just seems muted and muddy to me. Again, possibly user error, but for me it's a pass. Everything else was beyond my expectations and beyond what descriptions can describe. One final word on Fyrinnae. I actually had a problem with my first order being lost in shipping and Fyrinnae was WONDERFUL to deal with. They reshipped my order immediately and included an upgraded free sample in my order (you usually get a free mini sample with each order, about half the size of the purchasable samples). I was really impressed by the whole experience even though I had a lost package in there. Ordering with Fyrinnae takes patience! They are a small company, they craft orders when you make them and they clearly state processing time is between 24-30 days. They will take their webpage down from time to time, but don't panic. They do come back. It is frustrating when you really are jonesing for that shadow, but it's worth the wait. 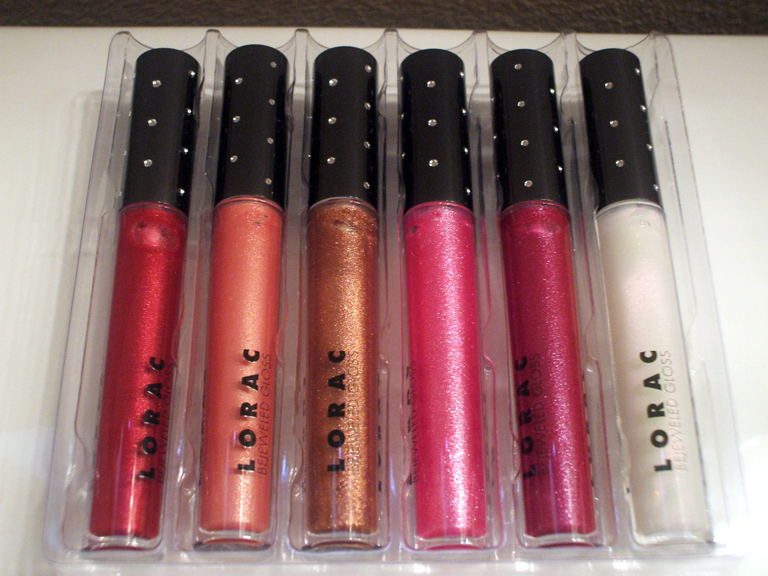 I received the LORAC Bejeweled Lip Gloss set from Sephora for Christmas. 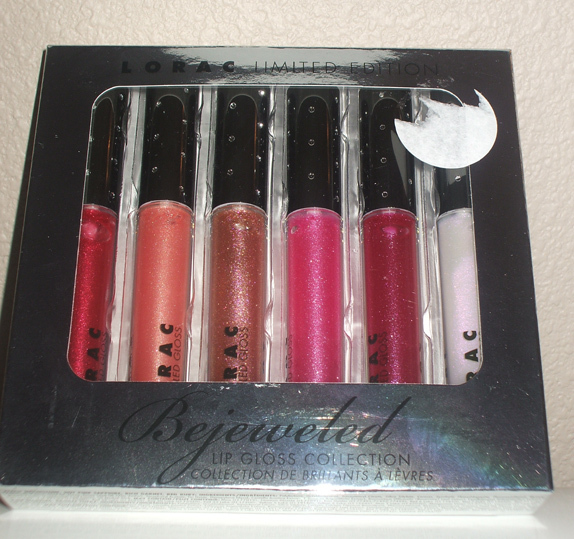 It comes with 6 x .11oz lipglosses. The finish of these glosses reminds me of a MAC Dazzleglass and they have a similar feel. These are non sticky, semi opaque glosses. They have a subtle vanilla scent and no discernible taste. 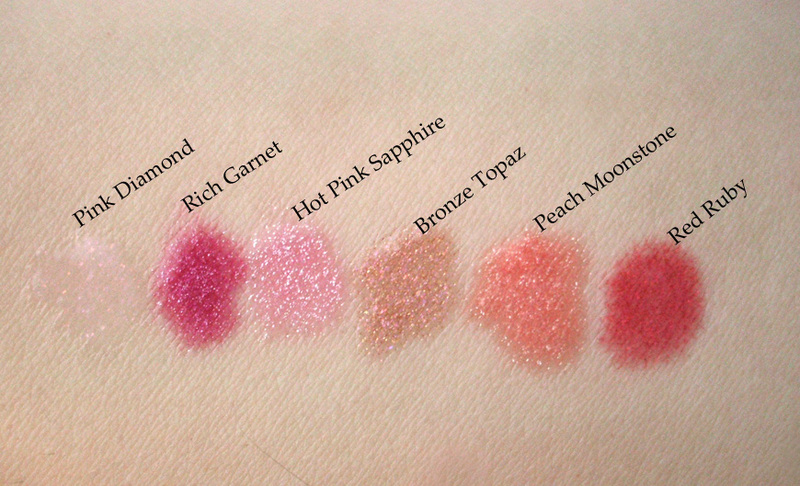 The colors in this set from left to right (above) Red Ruby (Cherry red with red shimmer), Peach Moonstone (sandy peach with golden shimmer), Bronze Topaz (cognac with pink and golden shimmer), Hot Pink Saphhire (bubblegum pink with purple and pink shimmer), Rich Garnet (deep berry with blue and pink shimmer), Pink Diamond ( milky glaze with a pink iridescence and pink shimmer). 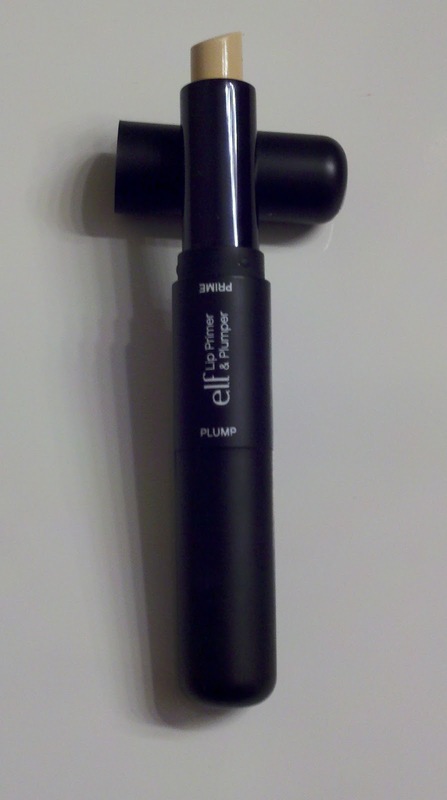 These come with a great brush applicator that helps you get really precise application. 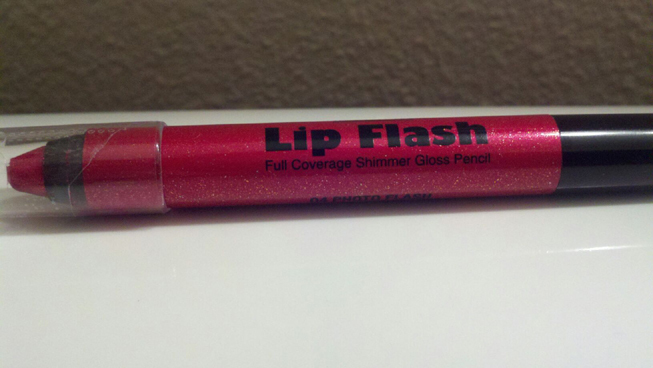 These glosses go on very thick so use it sparingly or you will find this migrating out the corners of your mouth. I find these to last 2-3 hours, with the color fading after 1 to 1 1/2 hours. 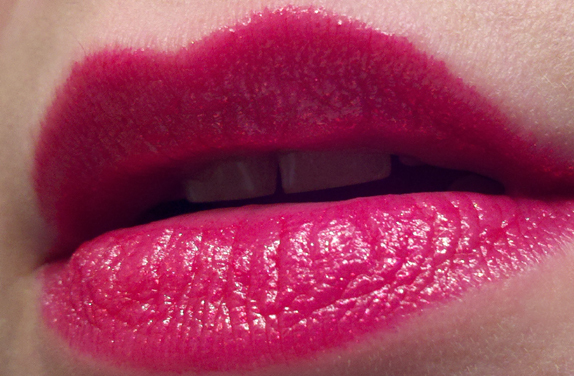 I did not notice the color settling into lip lines which is a huge pet peeve of mine. This is Rich Garnet. You can see the color is opaque enough to wear on it's own or you can layer these over lipsticks or liners for some interesting effects. I think I would layer these over other products due to the relatively quick fade time. This collection is a great value. 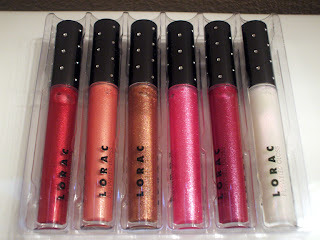 You get 6 nearly full size glosses (full size is .17oz and $22) for $25. Every color in this collection would work on any skin tone. I highly recommend! 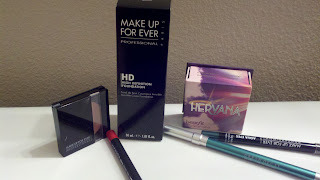 TBN Mineral Makeup Review Coming Soon! 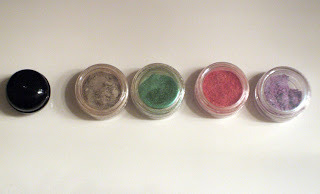 I've just recently started building a mineral eyeshadow collection and after seeing the wonderful colors snapped up by Jangsara recently, I thought I would make a small purchase and try some of the mineral shadows offered by The Body Needs. I am very excited and I will share some swatches and reviews in 2012! Was anyone else bummed to see the new Metal X shadows from MAC be savaged in the reviews. I really wanted Gold Carbon so bad I could taste it. I should have known. I have the 2007 Metal X Shadows and they really were pretty terrible. sigh Maybe if CCO has it this summer I might pick it up. This post is my gift to you. Like many of you in the universe I suffer from oily skin, I mean like "why God why?" oily skin. It has cost me self confidence, I have wasted untold hours and dollars throwing products at myself that failed to live up to claims and failed to do anything to fix my oily problem. I tried, moisturizers, exfoliators, powders, blotting sheet, powder/blotting sheet hybrids. I finally got to a point where I had to wash my face multiple times a day which just made it all worse. I read about Smooth Operator on Makeup Alley and it sounded too good to be true. So I tucked into my metal filebox and did not think much on it. Just one more thing that wouldn't work. But I wandered into Sephora one day and saw the Tarte display and figured I would give it a look. I shook a little product onto the back of my hand and spread it around. It was like sprinkling my skin with velvet. I was sold...didn't know if it would work, didn't care. It was velvety and I was in love. The very first time I used this product I was absolutely stunned. I can tell in an hour if something is going to work or not. Hour one, no shine. Two...no shine. Three, four.......eight! No shine!!!! No freakin' way. 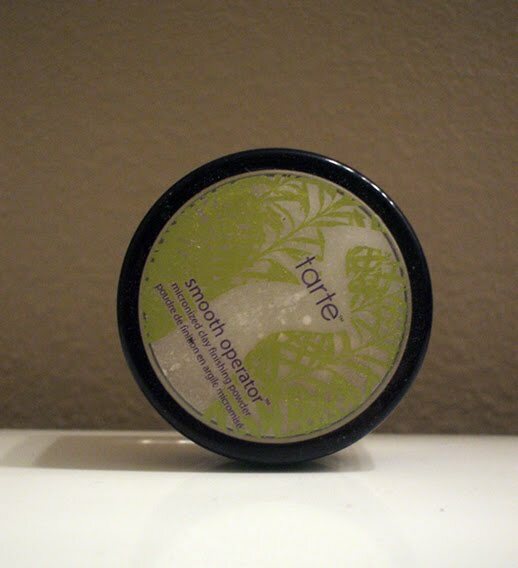 I used this product for a week and experienced no irritations (water bottled in heaven would irritate my skin) and with the exception of taking long walks on hot days, not a speck of shine to be seen. Not only that, now that I wasn't scrubbing and fiddling with my face every few hours, my complexion slowly began to improve. I had less cycstic acne, it just revolutionized my beauty routine. How does it work? What miracle turns oily into dewy glowing youth. Here is the info from the Tarte website. "The breakthrough technology of this micronized clay finishing powder improves the production of keratin, a building block of skin synthesis, to promote the tightening of skin and effectively shrinking oversized pores. Amazonian clay, nature's most perfect ingredient, acts as a total skin balancer by reducing dryness and flakiness, improving clarity and texture and removing surface oil to mattify skin for a soft focus and flawless finish." Now, I have read some claims disputing the region from which Tarte gets their Clay, some saying it comes from China, not the Amazon as inferred in promotional literature. Honestly? I don't care if it comes from Detroit. It works, it's safe, I am happy! The only issue I have with the product, and believe me it's minor, is the single hole sifter. The first few days I had this I was at a loss as to how to get any product to pass through that tiny hole. What I found works is inverting the product and smack it on the palm of you hand. When you turn it over most of the product will adhere to the lid. Drop it gently on the counter a few times to dislodge the powder and then apply. Careful! This is super, super fine and the tiniest breath a wind will send this stuff airborne (not pleasant when inhaled =/) Also, when first applied, you may have an overly airbrushed, frosted look (I call this the Anette Benning) this fades and ultimately your are left with a natural satin finish. I use this alone over bare skin for daily wear and over foundations on special occasions. I cannot recommend this more highly. This one product has restored my confidence, helped repair years of damaged skin and bad beauty habits. It is so worth checking out for yourself. Price: $28.00 USD for 9.07g/0.32 Oz. 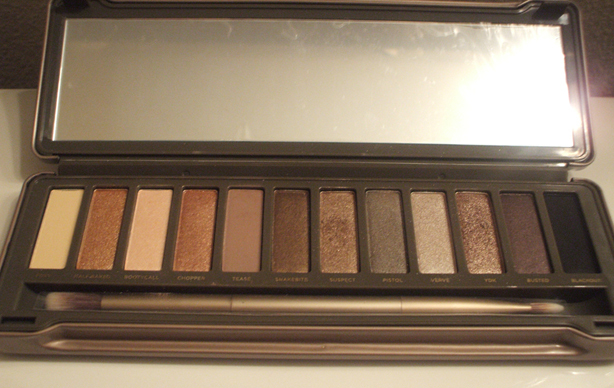 So, I feel like the last horse crossing the finish line when it comes to the Naked 2 palette. But, I could hardly call this "Cult of Taupe" if I did not share my feelings on the newest in the Naked line now could I? Nope! If you were a fan of the first Naked palette, Naked 2 will not disappoint. You may not find owning both palettes necessary, but for the value, $50 for 12 full sized shadows, you may as well pick this up. I personally prefer the color range of Naked 2 and if I did not yet own either palette, I think Naked 2 is the clear favorite. While many people really liked the variety and range in the original Naked palette, I had a tough time working with darker shades like Hustle, Creep and Gunmetal. They were a little too dark for daily wear and they seemed too cool, I just don't work well with blue and purple toned colors. This is where I feel the Naked 2 palette shines! Included in this palette are two gorgeous darker crease shades Blackout, a dense velvety black and Busted, a cooler toned purple shimmer. Both of these will easily take your daytime look into the evening with ease. The rest of the palette is comprised of 10 amazing neutral shades (I'm looking at *you* Pistol). I think the undertones of the neutrals in Naked 2 are far more universal. Foxy and Tease lack the yellow/orangey hues of Buck and Naked (from the original Naked) making them, in my mind, much easier to use for those of use who straddle the warm/cool color barrier. One gripe I have with Naked 2 is the re-appearance of Half-Baked. I don't inherently mind the idea of a re-promoted shade appearing in the palette, but did it have to be Half-Baked, or as I like to call it, the beauty industries most dupe-able shade ever...EVER!? I was a bit disappointed with the inclusion of a brush in this set. There is nothing wrong with the brush, but I am not a fan of synthetic eye brushes so this will end up lonely in a drawer. I wish UD would have included the Primer Potion/Dual Liner combo that launched with the original Naked palette. I think those would go a long way towards making this a singularly exceptional palette and are more useful to a beauty beginner. I know the Whiskey/Zero liner launched my desire to own more UD liners (another area where they shine). In summary, no lover of neutrals will regret owning this palette.